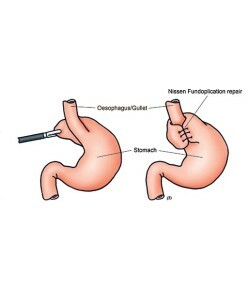 What is a Nissen Fundoplication operation for acid reflux? Nissen fundoplication is a commonly performed operation for acid reflux. The operation is done by laparoscopy (keyhole surgery), under general anaesthesia. It usually takes 60-90 minutes to perform, and involves overnight stay in hospital. The fundus is the uppermost part of the stomach. In a fundoplication operation, the fundus is ‘plicated’ or wrapped around the lowermost part of the oesophagus (gullet). This wrap is held in placed by stitches. The fundoplication strengthens the barrier to reflux at the lower end of the oesophagus. There are three different types of fundoplications, called Nissen, Toupet and Watson. In the Nissen fundoplication, the fundus is wrapped fully (360 degree) around the gullet. In the Toupet operation, the fundus is wrapped partly (270 degree) around the back wall of the gullet. In the Watson operation, the fundus is wrapped partly (180 degree) around the front wall of the gullet. There are pros and cons for each type of fundoplication. Nissen fundoplication is the commonly performed operation. If you have a hiatus hernia, the hernia will be repaired as part of the fundoplication operation. Can I eat normally after a Nissen fundoplication operation for acid reflux? You may get some difficulty to swallow or pain whilst swallowing for some weeks after a fundoplication operation. You should eat very mushy or sloppy food for the first 4-6 weeks after the operation. After 4 weeks, you may progress slowly to take solid food. Most people return to eating normally by 2-3 months after the operation. What is the success of Nissen fundoplication for acid reflux? 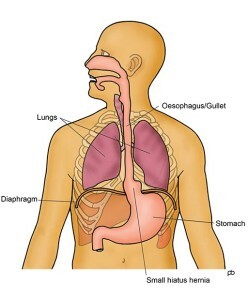 Most people have very good relief from heartburn and regurgitation after a fundoplication. Studies have shown high levels of patient-satisfaction and improvement in quality of life. But, your acid reflux symptoms may return with time. Studies have shown that symptoms remain well controlled in 90% of patients at 3 years after the operation, and in 70% at 5 years. About 30% of patients need PPI medication at 5 years after surgery, and about 50% need medication at 10 years or more after surgery. These percentages are different in different studies and range between 0% and 60%. But, in most studies about 20% of patients need to take medication at some time after fundoplication surgery. 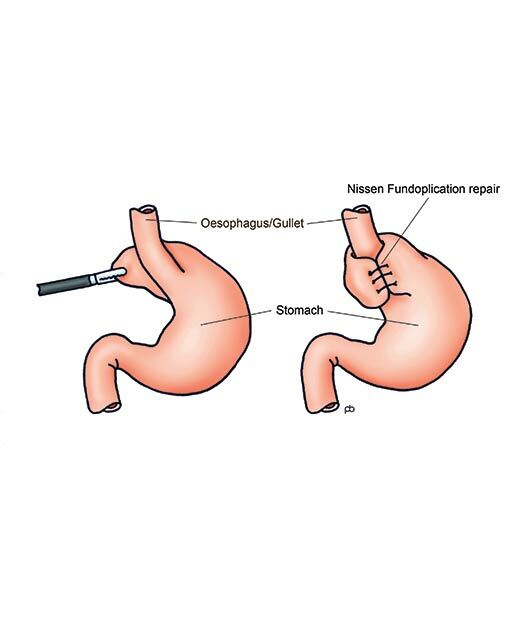 What are the risks of a Nissen fundoplication operation for acid reflux? Most people may a straightforward recovery and serious complications are rare. 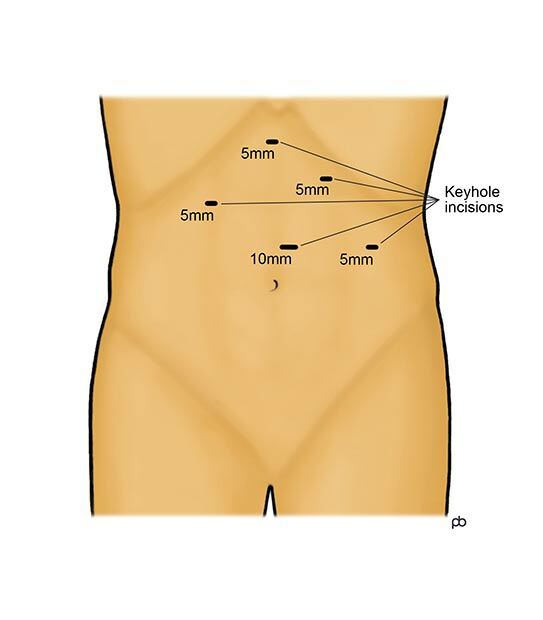 But all keyhole (laparoscopy) operations on your abdomen (tummy) carry some risks. There are three important risks that are specific to fundoplication surgery. First, your can get difficulty to swallow because of excessive resistance at the lower end of your oesophagus (gullet). This happens in about 1 in 20 people. The treatment is endoscopy and dilation (stretch) of the oesophagus or re-operation. Second, you can get gaseous bloating, excessive flatulence and difficulty to belch or vomit. Third, the fundoplication can come apart or become distorted, and a part or all of the fundoplication can form a hiatus hernia. Depending on the severity of your symptoms, another operation may become necessary. 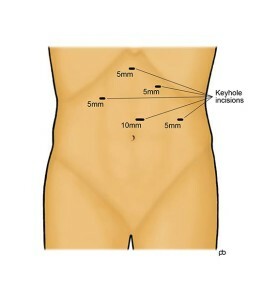 Re-operation is usually done by keyhole surgery. But, the risks of re-operation are higher than those of first-time surgery. Rare but serious complications are injury to the oesophagus, stomach, vagus nerve and pneumothorax (lung collapse).